The Excellence Award for 2017 has been won by West Suffolk Hospital NHS Trust. Hinchingbrooke Hospital, Abertawe Bro Morgannwg University Health Board in South Wales and East Kent Hospitals University Foundation Trust were highly commended. The team was praised for its “excellent mix of activity focused on people with diabetes and healthcare professionals”. Hubert Bland, Country medical chair and head of medical diabetes & cardiovascular for Sanofi UK, said: “The team showed a real commitment to go above and beyond to ensure important messages about hypoglycaemia were communicated. They obviously care a great deal about what they do and the patients that they look after. During the week staff wore campaign t-shirts, trained on a hypo simulation dummy and revised best practice by simulating both mild and severe hypoglycaemic incidences. 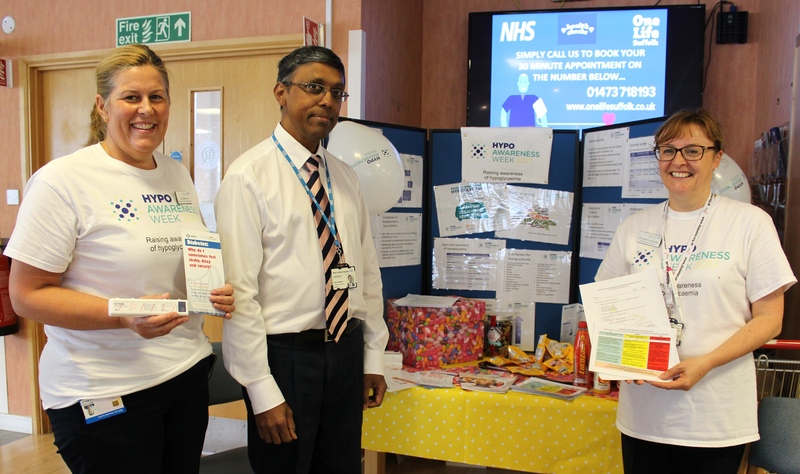 They also manned a stand in the staff canteen, created handy information cards for clinicians and put colleagues to the test with a quiz. There was a hypo slideshow in the diabetes clinic patient waiting room, while patients were also encouraged to log any hypos they experience and to use this to manage them more effectively. Hypo Awareness Week Excellence Award judges Esther Walden, the chair of the Diabetes Inpatient Specialist Nurse (DISN) UK Group, and Simon O’Neill, Diabetes UK’s director of health intelligence and professional liaison were tasked with deciding the winner. Judge Simon O’Neill added: “Many congratulations to West Suffolk Hospital for running a significant campaign. There was an excellentmix of activity focused on people with diabetes and healthcare professionals. The programme has been made possible with sponsorship from Sanofi. Sanofi has no editorial control over its contents.